Note : Limited Edition Release - contains 3 brand new songs and 7 re-recorded songs, taken from 'Big City' and soundtracks 'Sunrise' and 'Plage Tatoo/Circumstances'. Zita Swoon are cultural nomads. Their music, on record as well as on stage, is a journey through a long tradition of popular music. On this road they have encountered folk and blues, even seeking their way to eighties disco, making leaps between past and future, no real regularity kept in mind multi-angled music going from the absurd funk as Frank Zappa or Funkadelic know to express it, over the tradition of singer-songwriters as Bob Dylan, Neil Young, Joni Mitchell towards the eclecticism of Tom Waits or Einstürzende Neubauten and the programmed sounds of artists as Aphex Twins, DJ Shadow or Howie B. In a single song a total musical trip experience is to be discovered. A kindred spirit is found in a musician as Beck, who feeds every concert and record with references to a longmusic history. Complete originality is an illusion. In this state of consciousness Zita Swoon sets to work. Zita Swoon looks for a dynamic equilibrium, as the band balances between music as an irrepressible force of nature, experienced as the simple, primitive urge to express oneself in a musical, almost physical way and as processing their acoustic memory, paraphrasing and quoting the things that inspired or captured their feelings. It sometimes seems that singer Stef Kamil Carlens appears as a shaman, fiercely dancing, invoking demons and transforming a concert in a kind of ritual. And then all of a sudden, the next song winks at glamrock, or new wave, or techno. 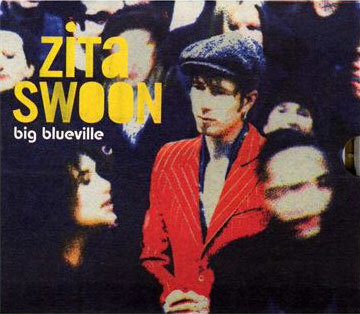 Do not expect Zita Swoon to be a living jukebox though. Their symbiotic music mingles a force of nature with influences of tradition, so that these two approaches fortify each other and form a new unity. Zita Swoon floats on a very fertile breeding ground of records, films, visual arts, theatre & dance and literature. Concerts are not held in one single mental place. In the same drive also the spectator is expected to travel along in that nomadic way, he has to want to take part in the journey. A performance of Zita Swoon is a work in progress. A snapshot in time, a track in a continuous research. A song changes its form, time after time. The stage is a laboratory and each night, the public is witness of a new experiment.